Are you ready for Easter? Are you wondering why we celebrate the resurrection of Jesus by finding eggs that were hidden by a giant bunny? Me too. 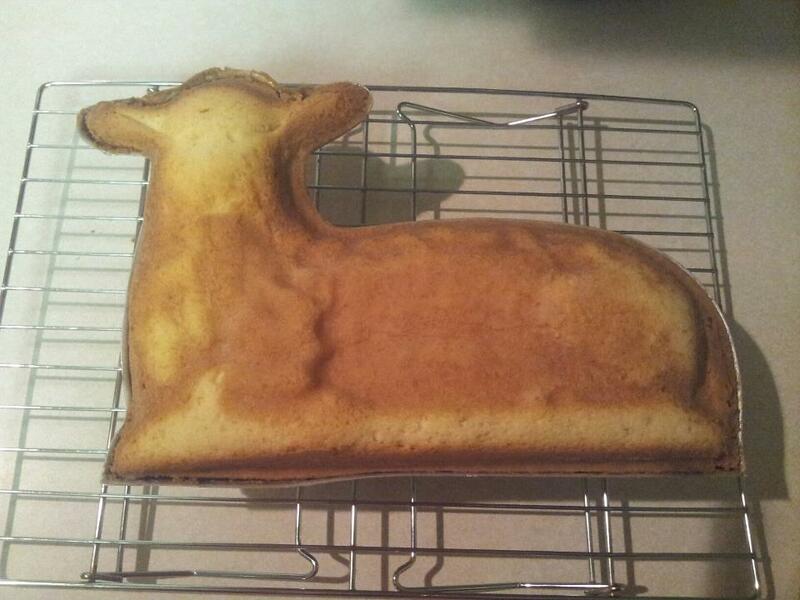 The lamb cake. Do you guys know about this thing? I’d never heard of it until my first Easter with my husband’s family. 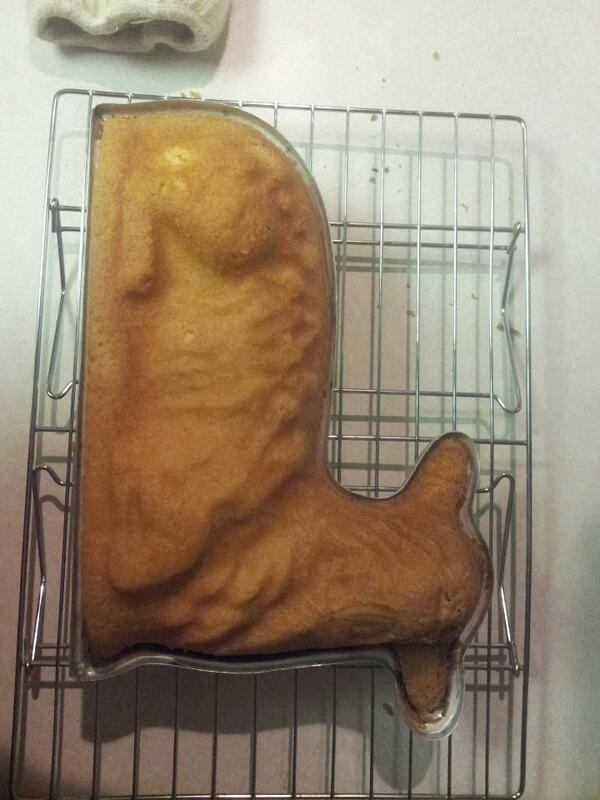 Every year someone in the family bakes a lamb cake. The process usually involves toothpicks, coconut, a lot of laughter…and a little cursing. Last year, my mother-in-law was kind enough to let me take a crack at it. I took this responsibility very seriously. 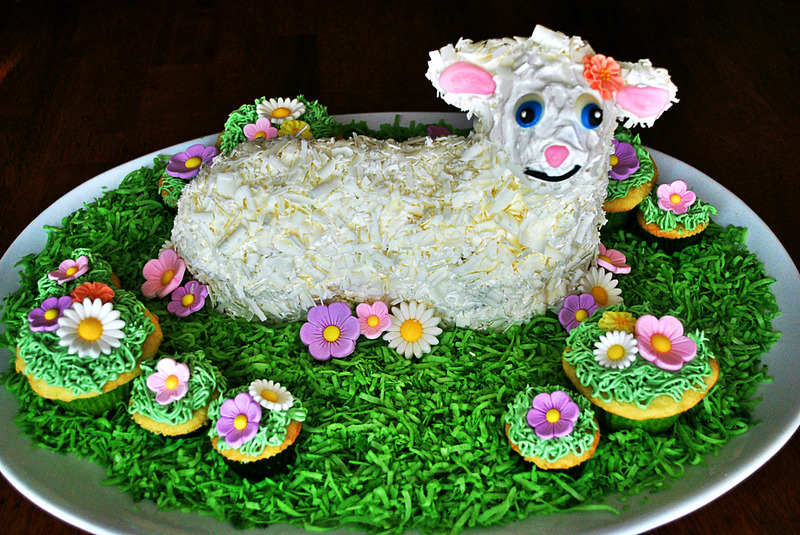 I spent a lot of time researching vintage lamb cake recipes, and happened upon a wonderful blog devoted to all things vintage baking and cooking. 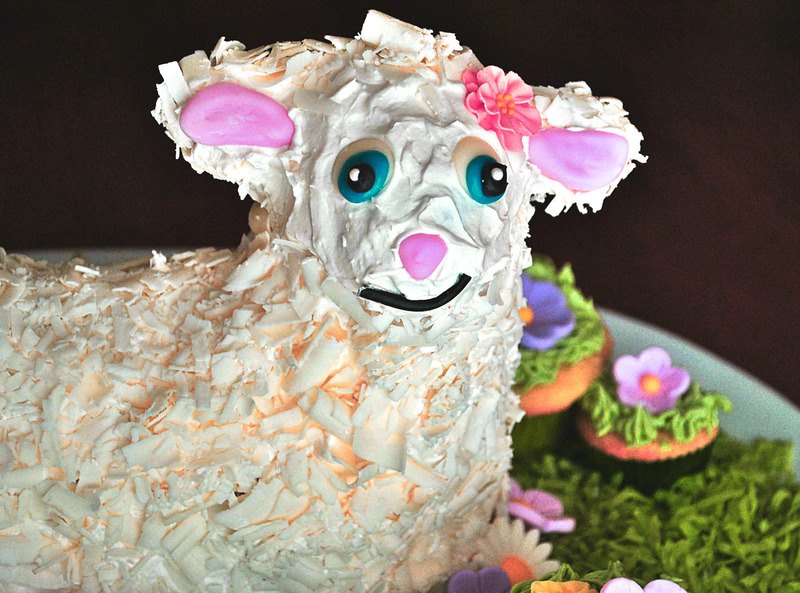 They did all the hard work and tested out 8 different lamb cake and frosting recipes. I took one of their highest rated recipes and crossed my fingers. Grease and flour the crap out of both sides of your pan!!!! Then, once your batter is prepared pour it into the face side of the mold, filling all the way to the top. Place the back of the mold on top and tie tightly with kitchen twine in a few places. 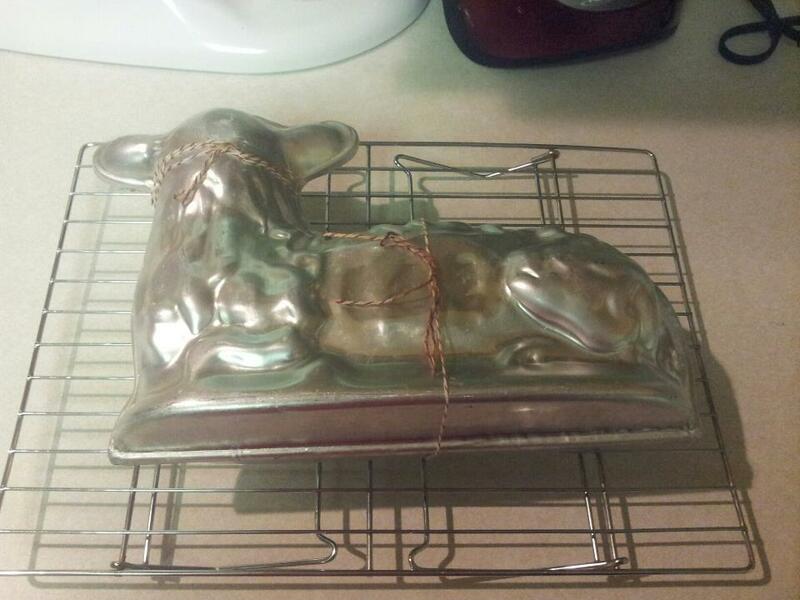 Place it on a wire rack and then on a cookie sheet and put it into the oven. Bake for 45 mins total. Bake at 450 degrees for first 15 mins, finish baking at 350 degrees. Let lamb cool for 15 minutes and then gently lift off the back mold, flip over and remove the front mold. Let cool before frosting. I used Coolwhip brand frosting and then covered it with shaved white chocolate. I made the eyes, ears and nose out of candy melts. The mouth is a piece of cherry flavored black licorice rope. The batter provided enough for one lamb cake and at least a dozen regular sized cupcakes. My father-in-law says there must be coconut, but I hate coconut, so I colored some with a little green food coloring and placed it around the lamb. I made a small batch of buttercream frosting and used it for the grass on the cupcakes. The flowers were pre-made gum paste purchased at my local baking supply store. Cream butter and sugar until fluffy. Add egg yolks one at a time, beating thoroughly after each one is added. Sift dry ingredients together 3 times and add to creamed mixture alternately with milk and vanilla, beating until smooth after each addition. 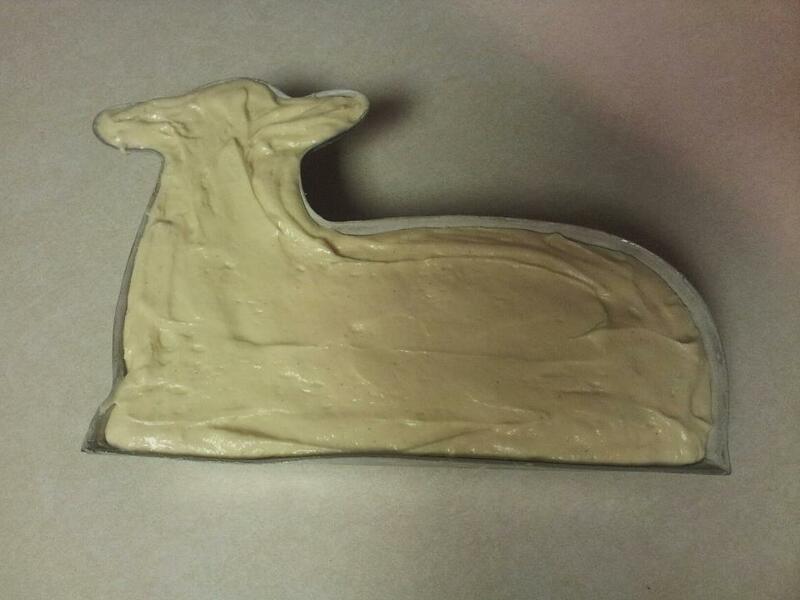 Grease cake mold thoroughly; fill face part of mold with batter. Cover with other half of mold and place in hot oven face down, baking for 45 mins. Bake at 450 degrees for first 15 mins, finish baking at 350 degrees. Remove from oven and let cool for 15 mins before loosening to take out.